One benefit of SLWGS membership is the opportunity to participate in Member tours and field trips four or five times each year. These events are not open to the public. Click on tour links for extensive photo collections. Thanks so much to our outstanding Special Events Coordinator, Pam, for her great planning of all these events! 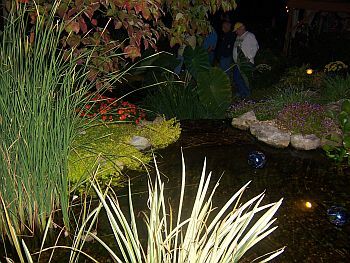 Five SLWGS members opened their backyard paradises to the 50+ members and guests for this fun, social event under starry skies. We had a beautiful end-of-summer night for our Tiki Tour 2017. 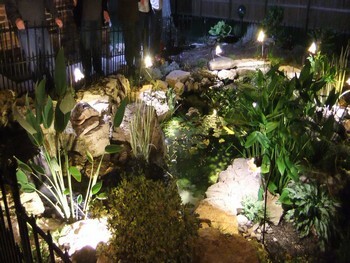 The ponds were lovely, the lights were entrancing, and many of our SLWGS members were on hand to enjoy them! Six SLWGS members hosted 75+ visiting members with flickering candlelight, glowing lanterns, and firey torches creating an awesome evening tour of fun and cameraderie. 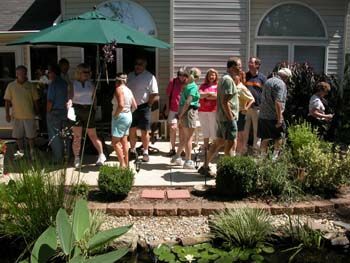 This year’s annual SLWGS carpool/caravan trip visited two member gardens with bonsai and two excellent retail locations for Bonsai, Water Garden Plants, Art Pieces, Fountains, and more. 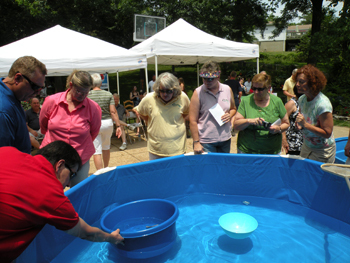 Our first koi auction included choice imported koi. There was a good turnout in spite of soaring temperatures. It was a great learning experience and a wonderful opportunity to purchase high-quality fish at reasonable prices. 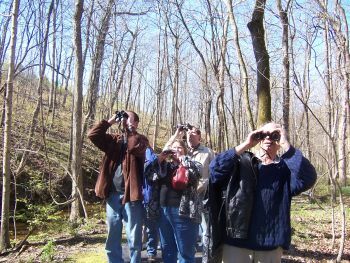 Interested SLWGS members enjoyed a spring bird-watching walk in the woods at Powder Valley with Bryan Prather of Wild Birds Unlimited. 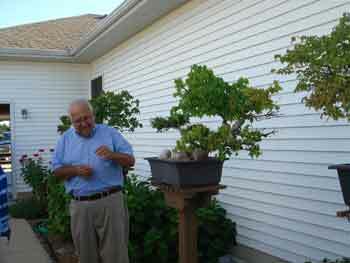 Dogwoods were blooming, May apples had popped up and Dutchman’s britches and Virginia bluebells were in abundance. Besides the more common birds, we saw a Sapsucker, a Phoebe and best of all, a Yellow-rumped Warbler. 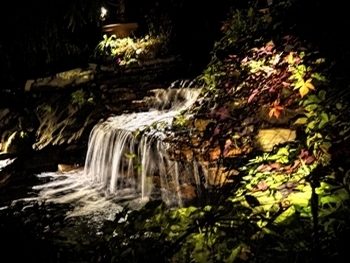 Our Saturday evening Tiki Tour provided a nighttime view of four different, lovely water features. 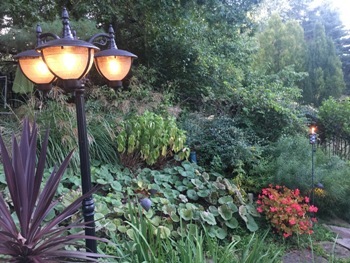 John and Laurie Saul, Art and Kathy Ruebel, Ray and Ginny Mueller and Barclay and Kelly Compton shared their hospitality and opened their gardens for us to enjoy. 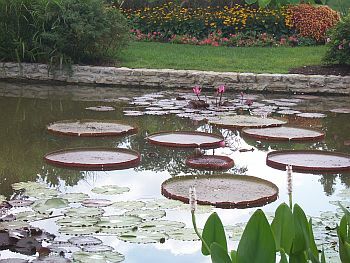 About twenty-five people came to tour the lily ponds at Tower Grove Park Sunday. In addition to seeing lovely ponds, lilies and marginals, there were wood ducks, a mallard, and a lovely green heron. 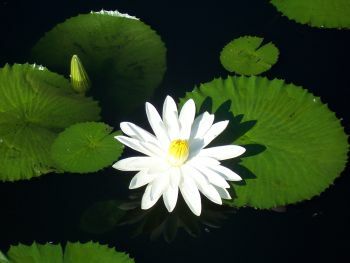 Beautiful lilies, good friends, rhythmic music, tasty food and unusual plants – what more could one ask. perfect weather? We had that too! The banquet was terrific! What could be better for a Cherry Blossom tour than three beautiful Asian-themed water features, with dragons, bamboo, a tea house and lots of good fellowship? Our sincere thanks to Pam Jokerst for an outstanding field trip! 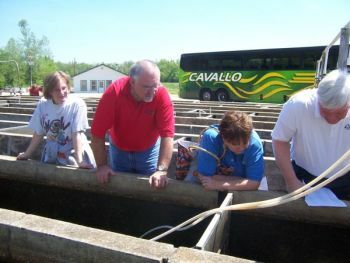 The weather was picture perfect for the thirty-eight people touring the Ozark Fisheries facility Saturday. 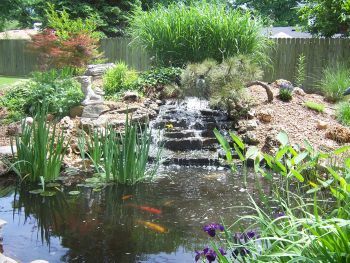 Members enjoyed a private tour of the hillside garden of Clyde and Meleena Byram, the patio and terraces of Mark and Lynne Toberman, the wonderful pond-side railroad of Bob and Elaine Temper, and the demonstration garden at The Pond Market by Aaron Burchett.